WYRD #1 tosses us into the action and establishes the basics for our titular character, though we don't get a whole lot beyond that. The artwork is strong, and hopefully, successive installments in the four-issue run will develop the story in more depth. Wyrd #1 introduces readers to Pitor Wyrd, a seemingly-immortal paranormal agent. Described by Dark Horse as “James Bond meets The X-Files,” the Feds call-in the cynical and smarmy Wyrd to clean things up when a situation gets too messy for normal means. This issue opens with Wyrd’s attempt at suicide, which is something that seems like a regular occurrence for him. After immediately recovering from his injuries, Wyrd’s handler tasks him with taking out a secret bioweapon gone berserk in Crimea. We feel out the character’s outlook and attitude here, providing a backdrop for the narrative of the four-issue miniseries. Curt Pires keeps his cards close to the chest about the broader story in Wyrd #1. However, we can parse out enough critical information to avoid being lost in this first issue. The writer lays the groundwork for some interesting ideas throughout. Of course, we’re left wondering about the titular character’s apparent immortality, though there may be certain clues laid by the creature Wyrd confronts on assignment. The intrigue on the periphery of the story is enough to make readers want to keep turning the page. Pitor Wyrd is a character in the mold of John Constantine; a noir figure in a paranormal setting. They have similar mannerisms, attitudes, habits, and manners of speech. Of course, the downside to this being the character suffers a bit by comparison. We get plenty of characterization for Wyrd, but little genuine emotional weight until the last few pages of Wyrd #1. That issue is compounded by the fact that Wyrd is surrounded by flat, nameless and unimportant characters. Wyrd’s handler, a little girl, and even the monster he confronts have little development. The most we get is from the solider who picks Pitor up at the airport and who muses for a few panels on local mountains. We can hope future issues will resolve this problem. 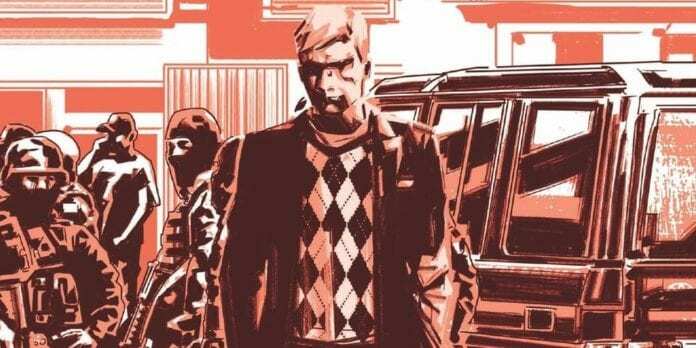 In Wyrd #1, though, the lack of emotional stakes keeps the reader from getting fully invested. The artwork provided by Antonio Fuso is a strong point for the book. The work employs a combination of sketchy, minimal styles and highly-detailed illustrations in equal balance, lending the book a unique and interesting aesthetic. Some of the action panels in Wyrd #1 are a little lacking in kinetic energy. However, anything the artwork lack in terms of dynamism, it more than makes up for in style. Fuso’s artwork, overall, is a treat to look at. Stefano Simeone’s color work presents an important contribution to the overall work as well. Softer, washed-out tones dominate most of the book, though moments of vibrant and saturated color cut through, providing contrast and highlighting some striking imagery from Fuso. Wyrd #1 is a solid start to the four-issue limited run. We can hope subsequent installments delve deeper, though, giving the reader some of the pathos and development missing here.